Bill’s Wicked Good Authentic Cape Cod Quahog Chowdah! Few things (and none that I may mention in polite company) give me as much pleasure as a bowl of well-tempered New England quahog chowdah. Simple to make, a pleasure to serve and comforting on all but the hottest days, especially coming off a brisk day of sailing, it is the perfect overture to a Maine lobstah bake. But, sadly enough, you rarely find the real deal on a restaurant menu. My very last true road gig, back in the summer of ’79, ended on a high note: a month on Cape Cod, playing a now-defunct jazz room in Hyannisport- The Velvet Hammer. Having not missed an opportunity to try “Cape Cod’s best clam chowder” in nearly every restaurant in town (they all claimed to be the favorite chowdah of the Kennedy family) I was surprised to discover that the best was right there under my nose all the time- the Velvet Hammer’s coveted quahog chowder. Rich with deep, nutty ancient deep water clam flavor and devoid of the usual gummy, distracting flour thickening, this was pure succulent bivalve gastronomic heaven in a bowl. There were two versions on the menu: fresh and day-old chowder. The day-old quahog chowder was 25 cents higher per bowl. Why? Because it needed to set up overnight; and, believe it or not, that actually did cause a significant improvement in taste. They didn’t offer a ‘three day-old’ option on the menu- there was never any left over for a third day. I had the chowder nearly every evening and, towards the end of our engagement, I started to fret over never being able to taste this wondrous concoction again in my lifetime. Then one night one of the cooks, who played acoustic guitar, approached me to request help in deciphering a Billy Joel tune he was trying to learn. I struck up a deal- I would write out the chord changes if he allowed me back in the kitchen, to watch him make their signature chowdah. To this day, I think I got the better end of that deal and I still make this Cape Cod classic at least three or four times a year. 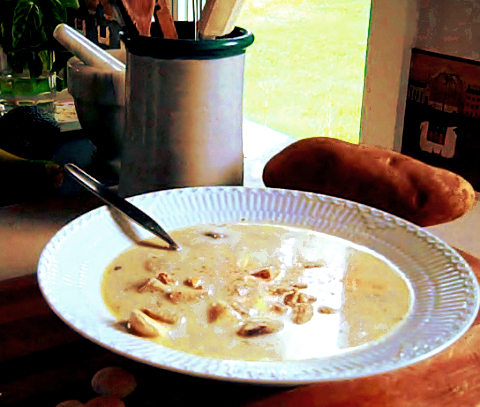 As I said, this chowder is simple to make and the ingredients can be found in your local grocery stores, except perhaps for some unfortunates living in landlocked states, who may not have access to genuine quahogs. In case you didn’t know, a quahog is a large, hard-shelled clam found along the east coast, usually forty years old or more. Sometimes referred to as ‘chowder clams,’ they impart that rich, nutty clam flavor to the broth- a flavor you won’t ever taste in most commercially produced chowders. In case you poor inland people can’t find a seafood market offering the true quahog, try to buy the largest cherrystones you can find and hope for the best. 1. In a medium or large stockpot, render salt pork slices on medium heat. 2. While pork is rendering, cut up the onion; add to the salt pork and stir frequently until onions are caramelized. 3. Chop celery, add to onions in pot. 4. Roughly peel and dice (not too symmetrical) the potatoes. Add to the onions and celery mixture, add the parsley and a little salt to the potatoes; stir frequently. A word here about clam shucking: This is the most difficult part, as these old clams tend to resent being opened and have the strength to deny you the pleasure. A good THIN-bladed clam knife helps but I have a secret which makes the job easier. While chopping onions, potatoes and celery and rendering the salt pork, set your bag of clams in the freezer (about 15 minutes.) This will not adversely affect the clams but will put them to sleep; the relaxed clam will be easy to open. Insert the clam knife blade into the heel (that protrusion in the back of the shell) and sever the muscle within. Go to the other side and sever that muscle. You now have an open quahog! Do this over a large bowl, as you want to save every drop of the juices. 6. Wash and strain the clam meat in a cup of water; set aside. Strain the wash water and clam juice through a fine wire strainer or cheese cloth, to remove any bits of shell. 7. Add strained water and clam juice to the potatoes; if broth does not cover the potatoes, add a litte extra water. Grind pepper onto the mixture, stir, reduce heat. 8. Chop clam meat and add to the chowder mixture. Stir and cover; cook on lowest possible setting for 3 to 4 hours, stirring occasionally. DO NOT BOIL! 9. Remove salt pork pieces and discard (the pork, not the chowder!) Add the half and half, stir and continue to cook ON LOW HEAT for 45 more minutes. Turn off burner and allow to cool, uncovered. 10. Place pot full of cooled chowder in refrigerator; let stand overnight. 11. Take out 2 hours before serving time and reheat. Serve in bowls or cups with a dash of paprika on top and a side of crusty French bread and butter. Wicked Good Chowdah! You are currently browsing the Food category at Bill Barnes Jazz.